Grilling your greens makes for tender on the inside while charred on the outside salad that changes the pace of your usual grilling routine. 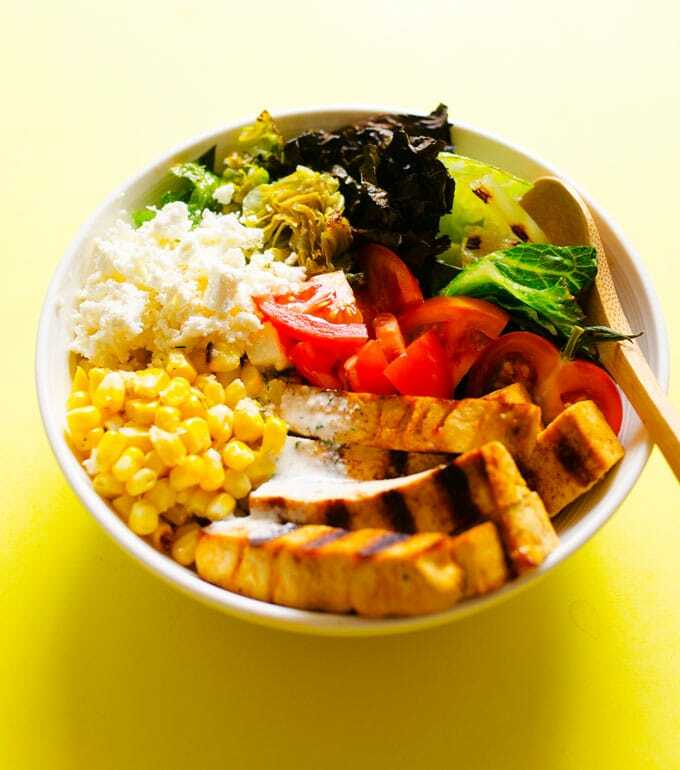 With crispy tofu, grilled corn, and your favorite summer salad toppings, this vegetarian Grilled Romaine Salad is turning out-of-the-ordinary into your new weekly dinner ritual. We just acquired a grill. Two grills, actually. And overnight we went from being the people who once took 3 hours to get a tiny charcoal grill hot enough to cook something to being the people who grill on weekdays because *no AC in European houses is roasting me alive and no way in hell is the oven going to be turned on*. One of the grills is a charcoal, which our previous traumatizing experience (of having to wait 3 hours for food) has kept us from really trying out yet. The other is electric and it, quite frankly, is totally awesome. So after having some success with grilling romaine on a stovetop grill pan while making Cook It Fresh, I thought we could give romaine another go on the electric grill. The result was romaine that turned slightly soft in the middle while charring and caramelizing on the outside. It becomes a bit sweeter but also a bit more bitter, and pairs perfectly with creamy dressings. Did someone say creamy dressings? Because just this week we made the *ultimate* homemade ranch dressing…with kefir! It’s tangy and herby and rich (and full of probiotics) (!!!) 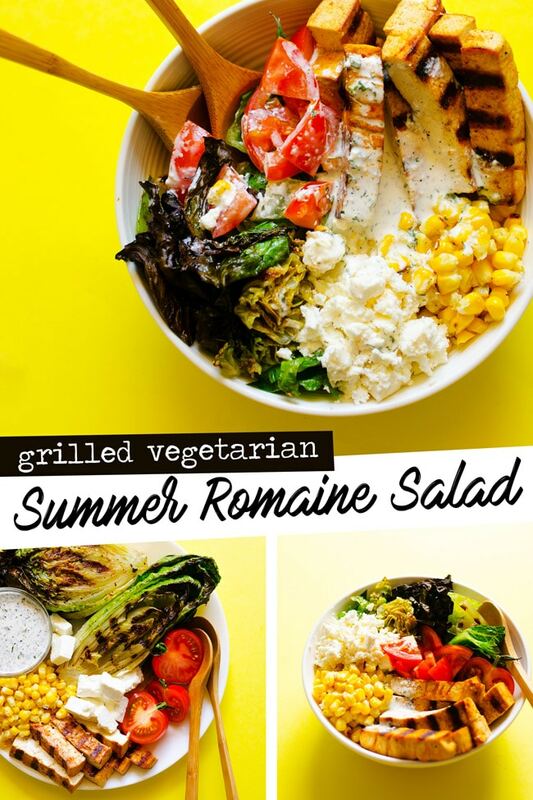 Before I go too far down the kefir trail (and how amazing and easy and fun it is to make at home)…let’s make some Grilled Romaine Salad. 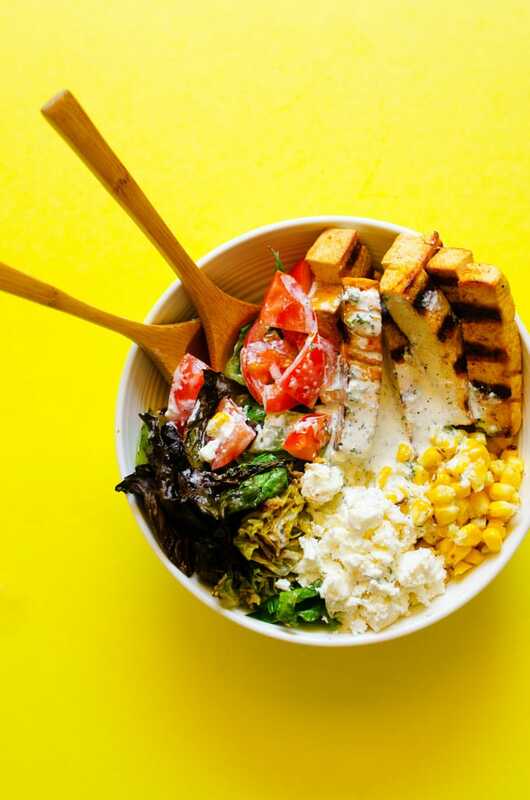 With crispy tofu, grilled corn, and your favorite summer salad toppings, this vegetarian Grilled Romaine Salad is turning out-of-the-ordinary into your new weekly dinner ritual. Tofu: Press tofu dry with paper towels and slice in half through the middle to form two thin slabs. In a shallow container large enough to fit the tofu, stir together oil, soy, garlic powder, and paprika, then add tofu slabs. Cover tofu with the marinade and let soak for 15 minutes while you heat up the grill. Prep: Cut romaine heads in half lengthwise. 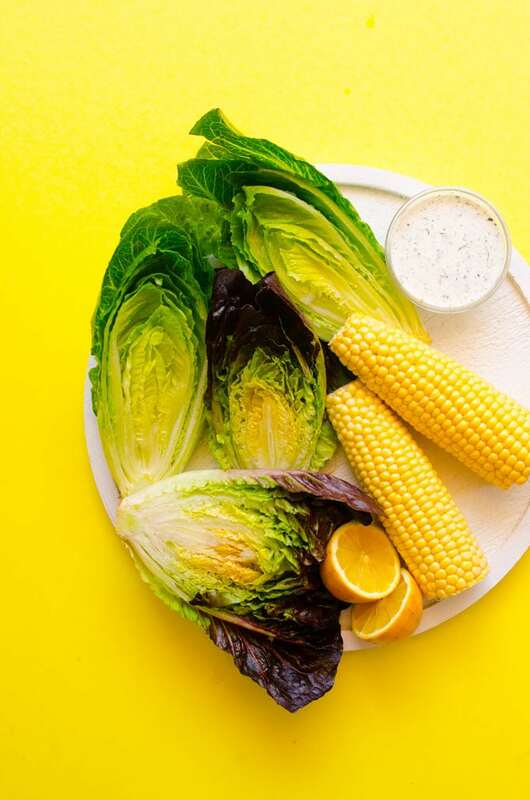 Combine oil and lemon juice, and liberally brush onto the romaine and corn. Cut tomatoes, crumble feta, and mix together kefir ranch dressing if using. 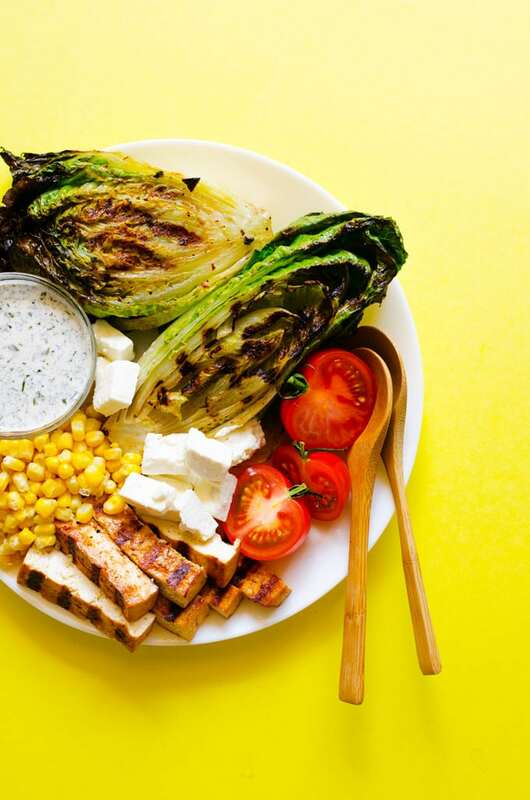 Grill: Over medium-high heat, grill corn (10 minutes, turning often), tofu (10 minutes, flipping once), and romaine (5 minutes, flipping once). 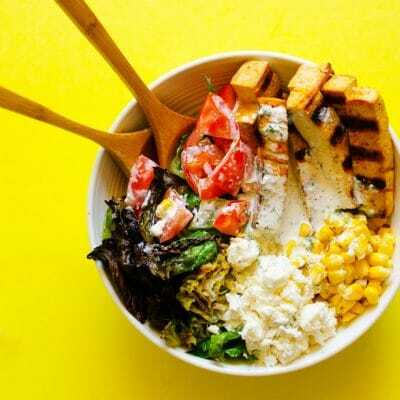 Assemble: Serve immediately, with sliced tofu, cut corn, tomatoes, feta, and ranch dressing.